What makes a truly beautiful smile? The Dental Press Journal of Orthodontics has revealed 10 elements of smile aesthetics, specific to the teeth. Check them out here! When a person smiles, are the edges of the front upper two teeth lower than the incisors? A visually pleasing smile has two front teeth that are in line with or slightly longer than the teeth on either side of that central pair. Basically, the maxillary incisors’ edges should somewhat conform to the curve of the lower lip when the patient smiles. Again, looking at the four front upper teeth, or the maxillary incisors, there needs to be a specific width to height ratio. Dentists measure this using a clinical caliper or use a digital model of the teeth and implement software that can measure those ratios. The proportion of the smile involves how many teeth are seen when the patient smiles. There is a “golden ratio” of 62 percent that is the ideal, but dentists in Singapore and throughout the world do not follow that ratio strictly. After all, there is beauty in individuality as well. How are the teeth spaced? Are there significant gaps, or are the teeth crowded? Dentists usually like to close significant gaps in the teeth; for example, if there is a gap between the two front teeth, Invisalign technology or veneers could be used to close it. Other gaps should be closed as well, using implants or aligners to achieve a more perfect smile. The gumline can also affect a person’s appearance when they smile. How much of the gums are revealed when the patient grins? In some cases, a significant portion of the gum shows above the teeth. This may or may not be something that a dentist can address. Gums may be receding too much, or they may be covering too much of the tooth or have uneven areas. There may be too much gum between certain teeth. To achieve the ideal smile makeover, your Singapore dentist may need to address a few gum-related issues. When you smile, notice the space between the curve of your teeth and the corners of your lips. It’s the gap between where your teeth curve around and the triangular corner of your smiling mouth. That space is called the Buccal Corridor. For some people, there’s a noticeable dark gap between the corners of the mouth and the teeth when they smile. Other people have a slight gap, and others have no gap at all—their teeth curve more widely thanks to a larger upper palate. An intermediate Buccal Corridor is a mark of a beautiful smile, but it isn’t something that your dentist will address in treatment. When you’re viewed from the side while smiling, how are your front teeth angled? Are they lined up neat and straight, with only a slight angle to the front teeth? If the front teeth overhang too much or are severely angled outward, your Singapore dentists will likely suggest Invisalign treatment to correct the issues. Sometimes, one side of a person’s mouth and teeth develops a little differently than the other, creating a lopsided or crooked look. This deviation from the ideal midline can often be adjusted with Invisalign. Your dentist also gauges the shape and colour of each one of your teeth. Any misshapen or broken teeth may be fixable with a dental veneer or dental implant. Stained or discoloured teeth may need dental veneers as well. 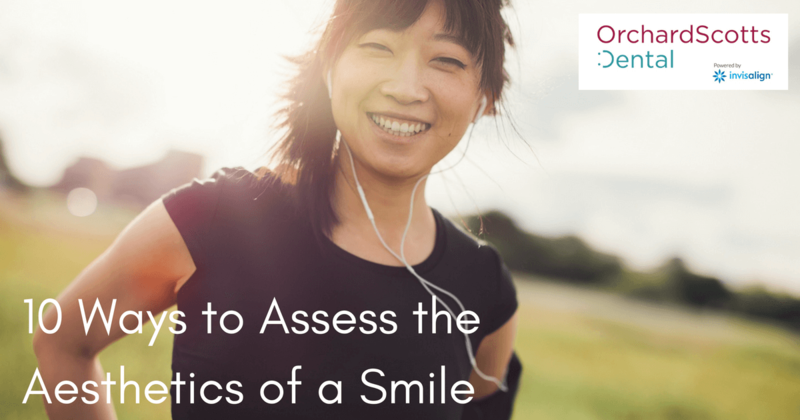 For a full evaluation of your smile, visit Orchard Scotts Dental. Our Singapore dental clinic is one of the best in the area, and our team will make you feel right at home. After a consultation and an evaluation, your Singapore dentist will recommend an effective treatment plan to give you the smile makeover you have always wanted. Original Source: “10 Commandments of Smile Esthetics,” Dental Press Journal of Orthodontics, July 2014.